And now it's A-L-L Over, 'cept for the Post-race celebrations and obligatory Monday morning Speedway winner's photo's... Did Mikey and one of his illustrious six drivers kiss the bricks? Chirp-Chirp, Bueller? Thus, was it one of Michael Andretti's Armada of six fire breathin' Dallara's pullin' into victory lane? Since Mikey & Co. have nearly a fifth of the field's entrants, most notably being Fernando Alonso, who I hope had a good race. As the Double F1 World Champion was flanked by two past Formula 1 cronies, Taku-san', nee Takuma Sato and the race's defending winner Alexander Rossi. As both of his F1 compatriots, well actually three of them never really got great looks in Formula 1, as Rossi barely got warmed up with his five outings in the back-marker Manor Marussia, while le Hamburgular', nee SeaBass', aka Sebastain Bourdais was Franz tost's punching bag at Toro Rosso! Arguably, the team leader is "The Dude!" aka Ryan Hunter-Reay, the 2012 IndyCar Series champion and 2014 Indy 500 winner, with the majority of his 16 wins-to-date coming during his Andretti Autosport tenure. 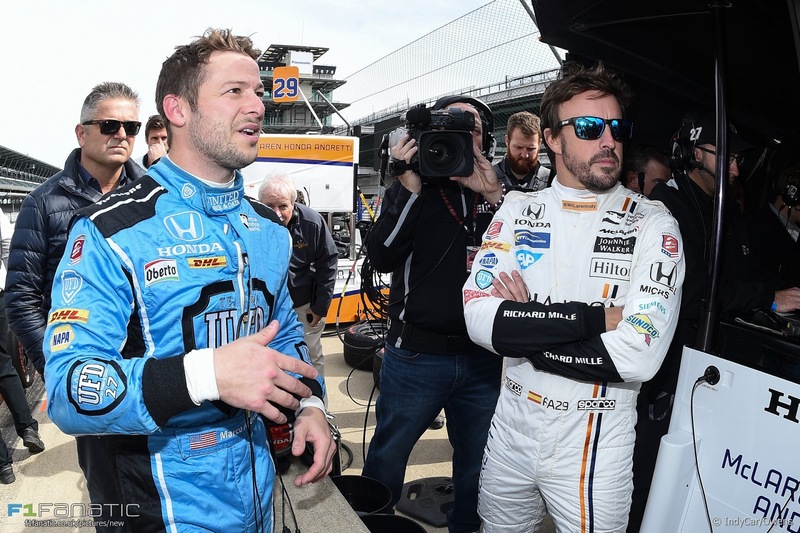 Marco Andretti, who Me Thinks at any other team would be gone... As what was that Quip last season 'bout Driving for Uber by PT, eh? Is hoping for finally finishing a race devoid of mechanical Gremlins, accidents, etc. Whilst theoretically he's got a shot at Mother Speedway, after all having finished an Oh, So tantalizing runner-up during his rookie debut in 2006. And the Mike 'N Mike squad, i.e. Mike Shank Racing running British rookie Jack Harvey for Mikey A' would probably beam over winning Rookie Of the Year (ROY) Honours ahead of his more esteemed Stable-mate, Ci! Next Up, Roger Penske sports five Bonafied contenders, with two of them being multi-time Indy 500 winners, including the only other ex-Formula 1 driver to have won multiple Grands Prix, ergo Juan Pablo Montoya. Meanwhile, coming in third on the hit parade is thee Cheepster', nee Chip Ganassi fielding four cars, as I keep forgetting he's got the other former Formula 1 driver on his books, Max Chilton, who's last major victory came on an Oval no less, albeit in an Indy Lights chassis at Iowa. A.J. Foyt, Dale Coyne and Schmidt Peterson Motorsports have three cars apiece respectively, and Ed Carpenter and Bobby Rahal & Co. field two apiece. While presumably, Juncos Racing finally confirmed who it's two drivers would be? Especially since Starship HC' most desperately wanted a full contingent of eleven rows of three rolling off Sunday. This just leaves us with three suito One car entries, i.e. ; Dreyer & Reinbold Racing, (DRR) Harding Racing and Lazier Partners, albeit the first two teams are sharing a collaborative "Technical Alliance" since they're working out of the DRR shop. thus, although Y'all know the answer, as hopefully we've managed to arrive in "the Other" Florence "Justin-time" for your humble No Fenders scribe to watch; Err listen to thou Gurr-reatest Spectacle in racin', since I'm pretty sure they lifted the Black Out in Oregon Dave; Hya! Thus, we'll see if I can copy thou OLD-est IndyCar Blogger Geo. Phillips winner's prediction curse here on No Fenders, Y'all know where George picks his winner for the race and SHUHZAMM, RACE OVER! As naturally the logical choice comes from the Usual Suspects, i.e. ; Penske, Ganassi and Andretti. As I'd say that all five Team Penske drivers are sure picks. While the Ganassi & Andretti camps aren't Full Houses, although certainly both of Cheeps' past Indy 500 winning drivers: Scotty "Iceman 2.0" Dixon & "TK' Follow-your-Schnoz!" Kanaan are definite Contendahs. Ditto for Mikey Andretti's lead gun The Dude! aka Ryan Hunter-Reay, or simply RHR, while I'd LUV' for Alexander Rossi to do the unthinkable and match HULIO'S previous record of back-2-back victories in his first two 500's! Whilst I suppose Marco could pull a Wabbitz' outta somewheres? And I'll throw in my three Dark Horses; Uhm, can Y'all tell I'm making Yuhs wait for my non-scientific answer, eh? 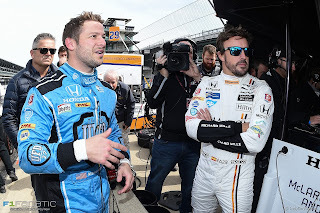 As thee Mayor 'O Hinchtown, aka James Hinchcliffe and his Rooskie' Sidekick, a la Mad Russian 2.0 Mikhail "loose is Fast" Aleshin plus Oriol "suitcase" Servia could surprise if the Hondre' engines as stout as last year. Giving the Bowtie runners equal Dark horse selections, obviously you can never overlook FAST EDDIE's, nee Ed Carpenter Racing, it's owner and my Cinderella choice J.R. Hildebrand upsetting Team Chevy's B-IG DAWGS' Penske Racing. As I made this choice the day prior to Fernando's first ever outing on an Oval, way before Opening Day, so who knows how close this will come up roses, eh? Trading Seats, Who'll Come Out on Top? IMS Pics' - Banners galore! F1: Can You See Me Now? NBCSN Nets Two Minute Penalty for Checking!